Was ever a ballplayer more pure New York Yankee…more representative of the excellence and the dignity and, yeah, the cool embodied by the Yankees -- at their most "Yankee" -- than Joe DiMaggio? He played his entire career in pinstripes. During five of his first six seasons, he led the Yankees to championships. He was a terrific, all-around ballplayer…the best of his time. "There’s no question in my mind. 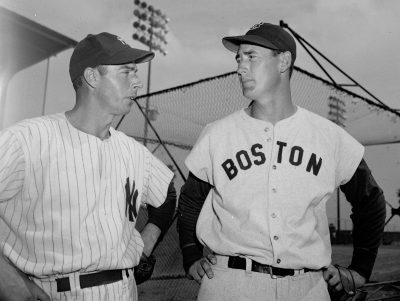 I played against Joe DiMaggio a lot of my career," Ted Williams said in an interview recorded in 1975 by former broadcaster and reporter Joel Alderman. The recording has been sitting on a shelf, gathering dust, ever since. Williams was effusive in his praise of the Yankee Clipper. "I was terribly impressed with DiMaggio and I thought that he was the best player – all-around player – for sure," Williams says. "And there’s a lot of great all-around players, too, but I don’t think they could quite match to his hitting. DiMaggio was a super hitter. Gee whiz. I mean, a super hitter." High praise from the fellow who’d announced at the beginning of his own career that he wanted to be recognized as the greatest hitter ever. And maybe he was. He was certainly as much the face of the Boston Red Sox, for whom he played his entire career, as DiMaggio was the face of the Yankees. How could it have been otherwise? Can anybody who was a baseball fan in those days imagine a baseball world so bizarro that Williams would be playing for the Yankees, and DiMaggio patrolling center field in Fenway Park? Impossible, right? "Before the 1947 season, allegedly, Tom Yawkey was meeting with a Yankee official," says baseball historian Glenn Stout, who has written extensively about both the Yankees and the Red Sox, the latter team owned for many years by Tom Yawkey. Stout recalled for us a dinner meeting between Yawkey and Yankees owner Dan Topping at Toots Shor’s restaurant in New York…a popular destination for, among others, Joe DiMaggio. "Others say it was at spring training," Stout says. "And that’s where the story gets murky, because none of this was reported at the time." Or perhaps not much reported. 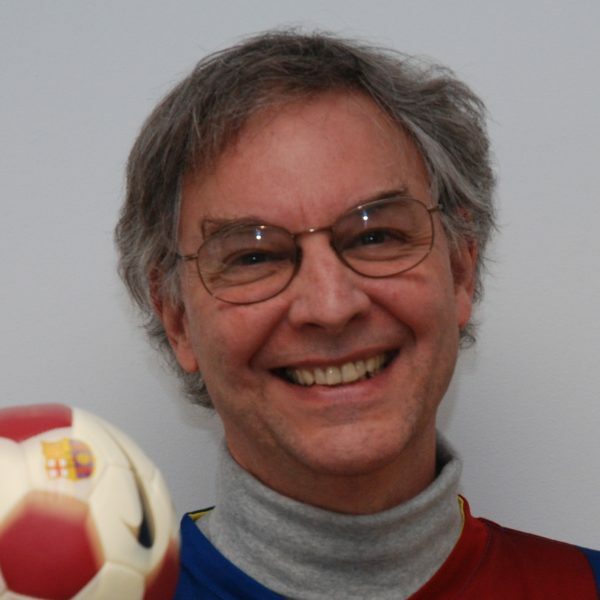 But over two decades later, the meeting did provide a column for celebrated New York Times sports columnist Dave Anderson, now retired. Anderson began following New York sports in the ‘40s, but he says he was not the first of his fraternity to write about the meeting…which he does recall. "And this was back, I believe, in 1948," Anderson says. "It could have been ’47. It could have been ’49. Dan Topping, who was the Yankees owner, and Tom Yawkey had been sitting together or having dinner together at the old Toots Shor’s restaurant in midtown Manhattan. 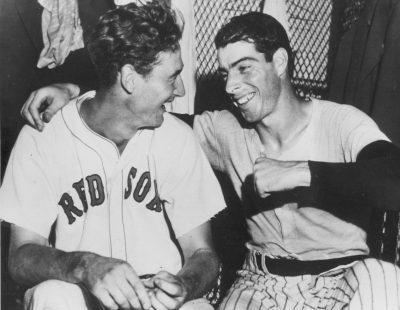 And in the course of, perhaps, a few drinks, they agreed to trade Joe DiMaggio to the Red Sox for Ted Williams, who would come to the Yankees." This was not, perhaps, as big a deal as a straight-up trade of Khrushchev for Kennedy might have been in 1960, but it was bigger than any other trade in baseball would have been. Each man meant everything to his team. But DiMaggio, quiet, reserved, elegant, beloved by the writers, was New York all the way. Williams was known to spit rather than tip his cap to his fans and he regarded a lot of the Boston press as treacherous at best. They weren’t exactly interchangeable, these two. Don’t you have to wonder how the subject of a trade even came up? "I’m sure there was a lot of scotch involved in this trade," Anderson says. OK. But according to Stout, there was perhaps some imagination involved, too. "You might be able to make the argument that, if you’re the Red Sox manager, maybe you do want Joe DiMaggio," Stout says. "DiMaggio gets to aim at the left field wall. 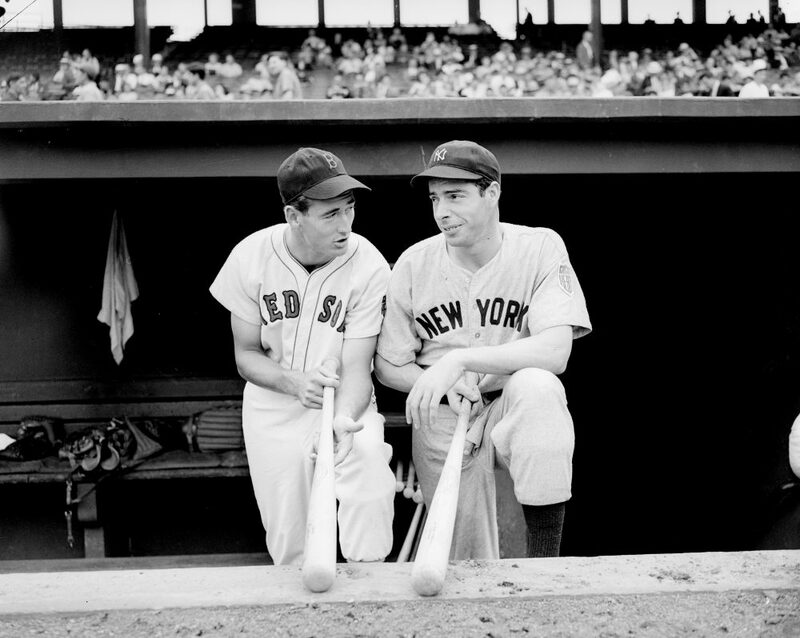 Maybe he hits a little better in Fenway than he did in Yankee Stadium, and he gets to play with his brother." Makes a certain kind of sense, right? Joe joins his brother, Dom, in the Boston outfield. The park is made for a right-handed line-drive hitter. 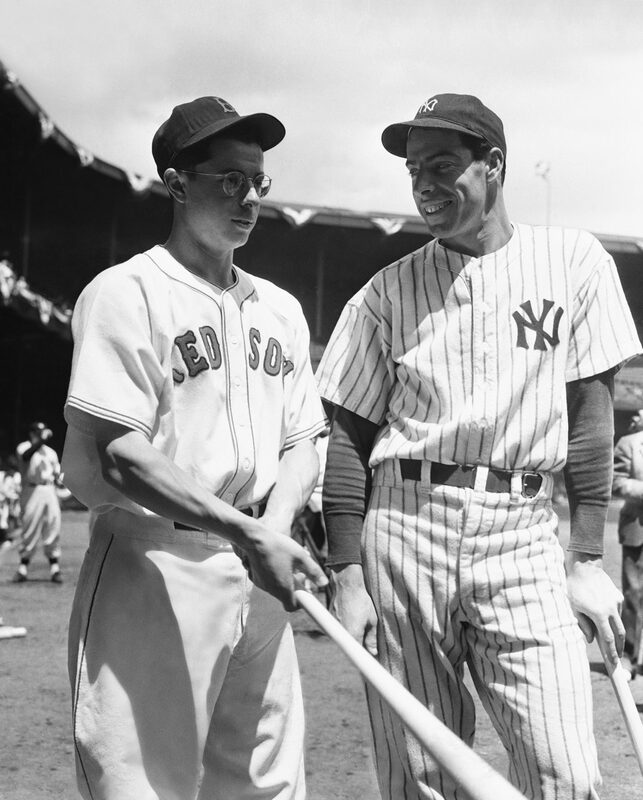 Maybe Joe DiMaggio would have led the Red Sox to at least a couple of those many pennants the Yankees won. Meanwhile, in the Bronx, Williams could aim at that short porch in right field. In another interview Joel Alderman recorded with Williams well after the slugger had retired, Williams thought about that. "Well, I think it’s easy to say that," Williams says. "And it could very well be true. But I know, from my experience, that I got balls to hit in Boston because of the long right field fence from the very pitchers that I might have hit at in Yankee Stadium that I would have never gotten a chance to hit that same pitch in Yankee Stadium. Because, the fence being long, they said, 'Well, we gotta make you hit here.'" So Ted Williams was willing to consider what it would have been like if Yankee Stadium had been his home park. Not many hitters would have approached that hypothetical situation as thoughtfully. And that wasn’t the only quality the Yankees would have found attractive in the late '40s. Williams was younger than his Yankee counterpart. "If you were thinking long-term, somebody who’s going to be in the lineup for the next 10 years, well, that was Ted Williams," Stout says. "It wasn’t Joe DiMaggio." The trade was not to be. One version of the story has it that Tom Yawkey woke up the morning after making the trade with a headache and a sick feeling in the pit of his stomach: the former from all that scotch, the latter the result of the realization that he’d traded his franchise player for a fellow who might not have many years of excellence left. But according to Joel Alderman, who interviewed both Williams and DiMaggio, the truth was more complicated, and Tom Yawkey was less hungover. "He wanted the Yankees to throw in another ballplayer," Alderman says. "And that ballplayer was a rookie left fielder by the name of Larry 'Yogi' Berra. And that was the end of that discussion. It turned out that Yogi was the dealbreaker." Maybe, and maybe not. Nobody could have guessed that in the next decade, Berra would be the league’s most valuable player…three times. The Yankees hadn’t yet asked him to try catching. So the Williams-DiMaggio trade failed to happen for reasons that may have had nothing to do with Berra. But while Joel Alderman contends that neither side was ever serious about the exchange — at least in the cold light of morning — Glenn Stout says there had been some talk of trading Williams even before DiMaggio’s name had come up. "At the end of the 1946 season, just before the World Series, front page news in all the Boston papers that there were rumors that Ted Williams was going to be traded," Stout says. "So Ted played the entire 1946 World Series with this enormous cloud over his head: 'Am I going to be traded?' At that time period, who else would you have traded Ted Williams for? Who else would you have traded Joe DiMaggio for?" "The important thing, really, is that we’re still talking about them. How many players who played in the '40s do we talk about now?" Hypothetical questions, rumors, stories where the dates, times and locations are up for grabs. It’s all the stuff of dreams, I guess. Or maybe nightmares. "Because here’s where it’s all fraught with peril," Stout says. "If Ted would have went to New York and hit .250; if Joe would have went to Boston and the Red Sox finished fourth, then somebody is gonna have to own that. You know, because we all kind of look at it as it might have been a great thing. But it also could have been a bad thing." Actually, tantalizing as the trade story – or stories – might be, even 70-odd years after the fact…or fiction…there is one thing about which our three baseball historians agree. "It’s hard to see Ted in pinstripes," Stout says. "It’s hard to see DiMaggio wearing a 'B' on his cap." "Ted Williams belonged in Boston, and Joe DiMaggio belonged in New York," Anderson adds. "DiMaggio was Mr. Yankee and Williams was Mr. Red Sox," Alderman says. "And it stayed that way, fortunately." And perhaps that’s where the story should be left, except for a postscript that says something about the game itself. In every sport, players change teams. In every sport, fans gobble up rumors and talk about what they’d do if they were granted the mighty power of a general manager. And as retired columnist Dave Anderson sees it, the passage of time means nothing to those who deal in such might-have-beens. "The important thing, really, is that we’re still talking about them," Anderson says. "How many players who played in the '40s do we talk about now?" Not many, I guess. And many fewer still in any sport but baseball, where the myriad numbers players generate and the quirks of the parks in which they play make idle speculation about who would have done what if they’d traded jerseys such fun. This segment aired on July 8, 2017.